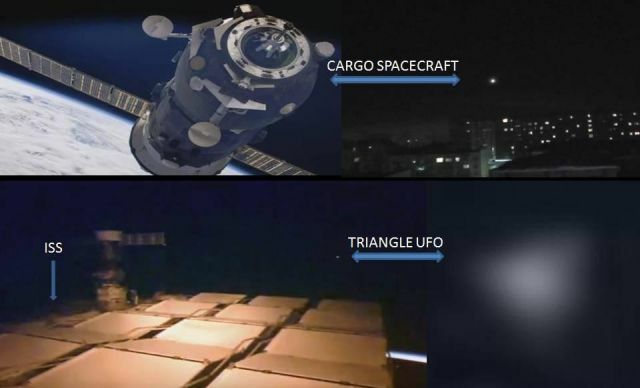 Triangle UFO spotted Near ISS - Cargo Spacecraft On Its Way To ISS Explodes! The Russian Space Agency reported that it has lost its Progress cargo spaceship following the disruption of the data signal. The cargo vehicle was to deliver 2.6 tons of supplies to the International Space Station (ISS). The Progress M-04 cargo spacecraft was lost at a height of 190km (more than 623,000ft) over a remote mountainous area of the Russian Republic of Tuva, Roscosmos said in a statement on its website. Credit top right image: Amicha Stein. Local people reported seeing a flash of light and hearing a loud boom while Amicha Stein posted an image on Twitter (see top right image) showing an explosion in the skies over Tuva, Russia around the time the ProgressMS04 vanished. The Russian space agency would not immediately describe the malfunction, saying a state commission is carrying out an investigation into this event, reports RT. After a cargo spacecraft from NASA's supplier SpaceX exploded on the launch pad at Cape Canaveral last September, the Progress M-04 cargo spacecraft is the second craft in a short period of time that explodes without knowing what caused the incident. Coincidence or not but at about the same time the cargo spacecraft vanished, a triangle UFO has been spotted near the International Space Station! See video below.